According to Bloomberg, with reference to Aaron Brown form AQR Capital Management, 40% of Bitcoin is owned by roughly a thousand users around the globe. The expert says that those “whales” may exchange information and coordinate their efforts to move the BTC exchange rate in any direction they want. In particular, those whales are believed to know each other very well since they have been in the business ever since Bitcoin came into existence and wasn’t treated seriously by the international community. If that’s the case, those guys have made themselves billions of dollars since then. For example, The Telegraph reported about the world’s first Bitcoin billionaires ­– the Winklevoss twins. They own 1% of Bitcoin and aren’t going to sell the stack since they think this has been an excellent long-term investment. One day, they bought Bitcoin at $120 per 1 BTC. Now the exchange rate has come close to $20K. They call Bitcoin an improved version of gold. Indeed, Bitcoin has been driving international investors crazy over the last few weeks. For instance, last week the cryptocurrency was trying to test 19000 USD/BTC. Today, it has retraced all the way down to 13500 USD/BTC. Apparently, the market has been extremely volatile, which is not typical of conventional financial markets. 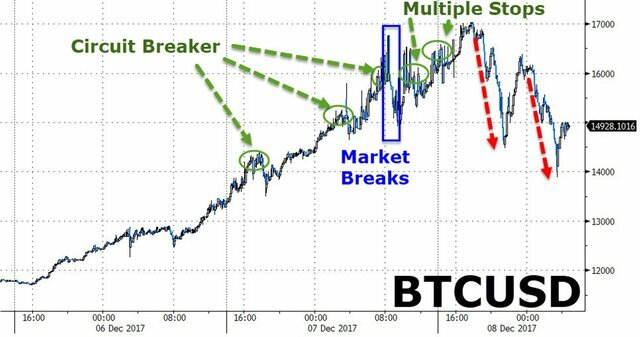 However, such ups and downs may come to the futures market when the CME and the CBOE launch their Bitcoin futures. It’s interesting to note that if the contract price changes by 7% or more, the trading is paused for 2 minutes. If this is a 20% change, the trading gets suspended. The chart below shows us that Bitcoin violated this limit a couple of times last week.